Just Where DOES One Put 175 Houseplants? Have You Ever Seen a White Peacock? Close your eyes and picture in your mind an amaryllis. It very likely will be red, with large petals and white anthers whose ends are covered with yellow pollen. It might be 'Red Lion.' You know the one - during the Christmas season you can find it most anywhere. It's beautiful, and deservedly popular. But there is much more to the world of Hippeastrums. They originated in Central and South America, and later were introduced to Europe by the Dutch bulb masters. Some of the Dutch growers moved to South Africa and continued their industry there. All the while, cross-breeding was taking place with many different types of bulbs - Single, Double, Miniature, Cybister, and Trumpet. Today, there are over 600 hybrids and cultivars. 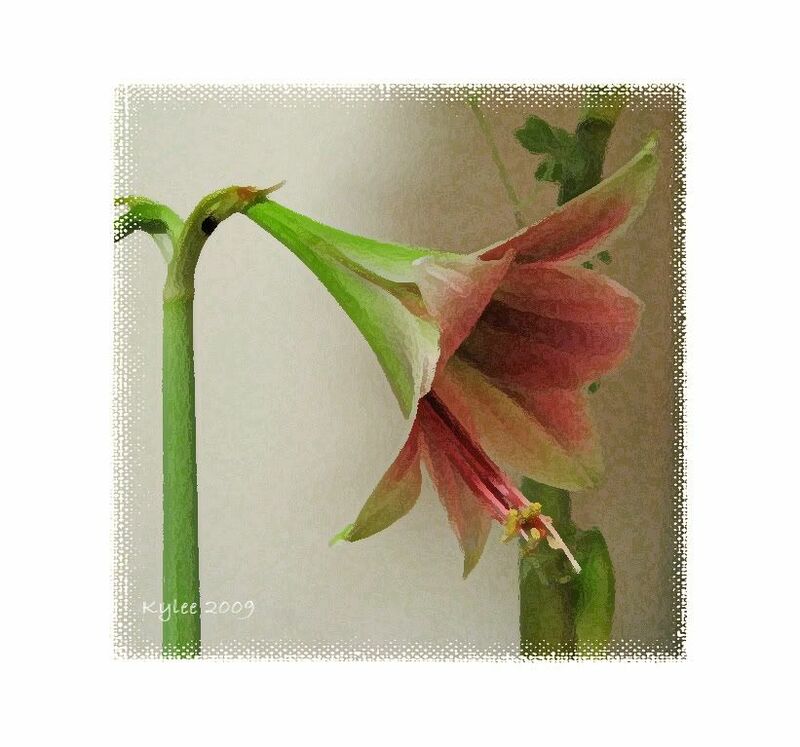 'Misty' is a trumpet amaryllis, with smaller flowers that resemble the trumpet lilies. I have had this bulb for three years now, and it has bloomed each one of those years. In order for a bulb to produce a flower scape, it must grow at least four large, healthy leaves during the summer growing season. I plant my bulbs in a separate garden for the summer and basically forget about them, except for fertilizing them about once a month. If we've not had a lot of rain, I will water them. In September, as night temperatures cool, I dig them up, cut the leaves off and put them in the basement for a couple of months or more, until it's time to pot them up again. Once in awhile, they will bloom in the summer garden. 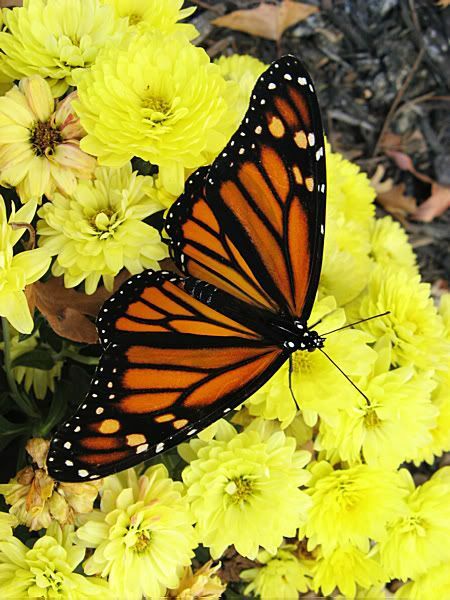 I am totally captivated and awestruck by the migration and breeding of Monarch butterflies. If you're unfamiliar with their amazing story, be sure to tune in (or DVR it) on Tuesday night, when PBS airs The Incredible Journey of the Butterflies. 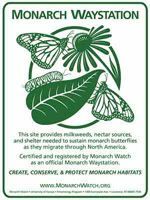 NOVA filmmakers have gone to extraordinary lengths to track and research the two-month, 2000-mile trek the Monarchs make each year. Until just a few decades ago, little was known about this phenomenon. 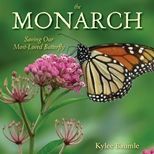 There is still mystery as to just how the Monarchs manage to travel from their various summer habitats to the same exact location in the highlands of Mexico. Be sure to check your local PBS listings for the exact time this may show in your area. For me, it begins at 8:00 p.m. EDT. If you miss it, you can view it online here, beginning January 28th. 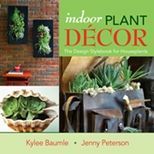 Edited to add: Cameron, at Defining Your Home Garden, has posted about the documentary as well in her 1-26-09 post. 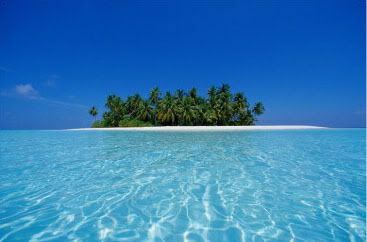 What a wonderful thought, to be on a desert island right now. No coat, no gloves, and even no shoes if I don't want to wear them. 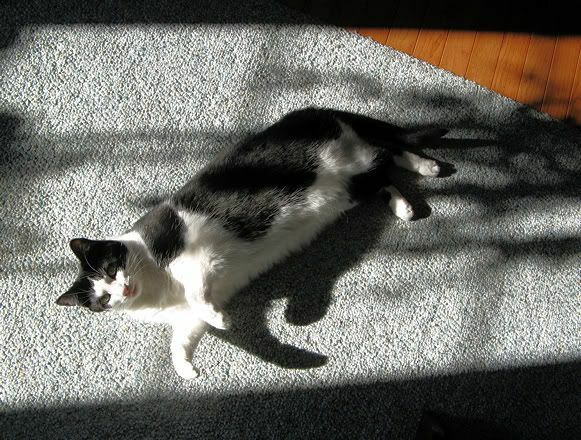 If I try hard enough, I can almost imagine the feel of the warm sun on my skin. A fellow garden blogger, Shirl of Shirl's Garden Watch, has posed the question, "If you could take any three plants with you to a desert island, what would they be?" There are no conditions limiting your choices; any and all plants are eligible, because on this idyllic island, everything grows. It's in contemplating this question that I realize how very limited my knowledge of plants is. I know many plants that can be grown in Zone 5, because that's what's in my personal palette. Outside of a few tropicals, the plants I "know" are but a fraction of what I can choose to take on the island. I'll choose what I know and leave those other things to my fellow islanders that are familiar with them. Okay, down to the business of making my choices. This is really tough. So I thought to myself, "What would I miss if I didn't have them?" Let's just assume that I can take as many varieties of these as I want, because there are too many gorgeous ones to pick one favorite. If you've ever seen a group of them in bloom (in the ground), there's nothing quite like them. 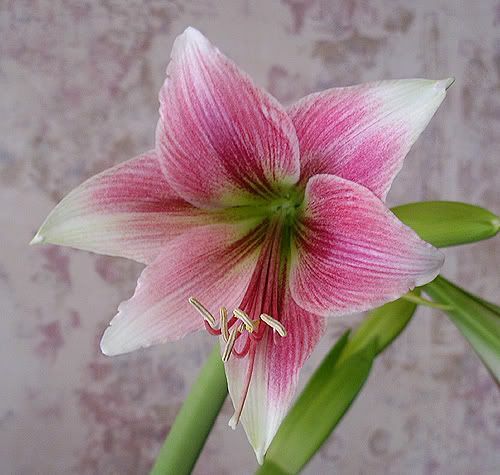 I've been known to spend several minutes staring an amaryllis bloom in the face, studying the patterns and colors in their petals. I've got several roses (teas, grandifloras, floribundas, English, miniature), but the one that gives me the greatest joy is 'Disneyland.' 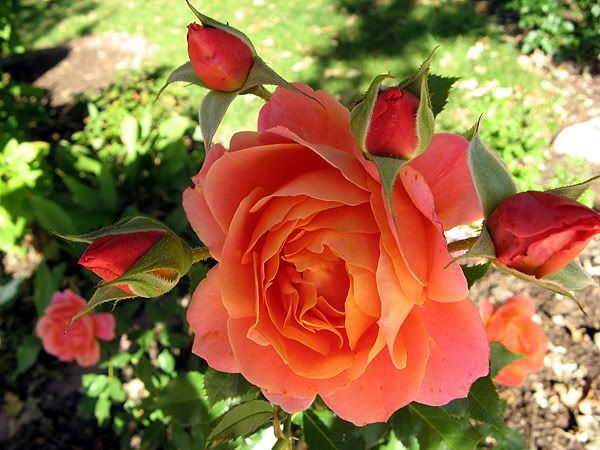 It's a floribunda, and with several blooms clustered on each stem, each is a rainbow of orange, peach, salmon, pink, and just about every other color in this family. 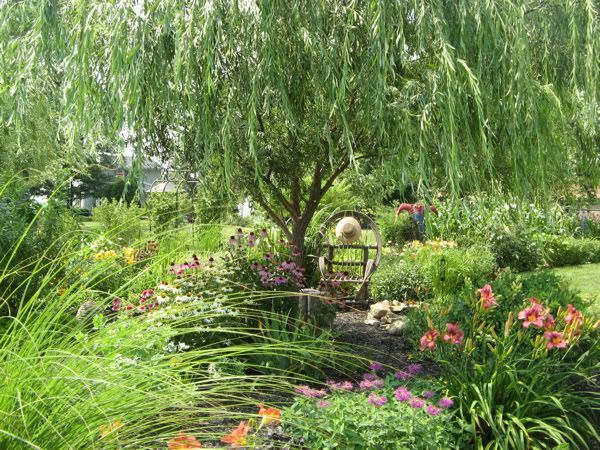 Trees are plants, too, and I absolutely love our Weeping Willows. 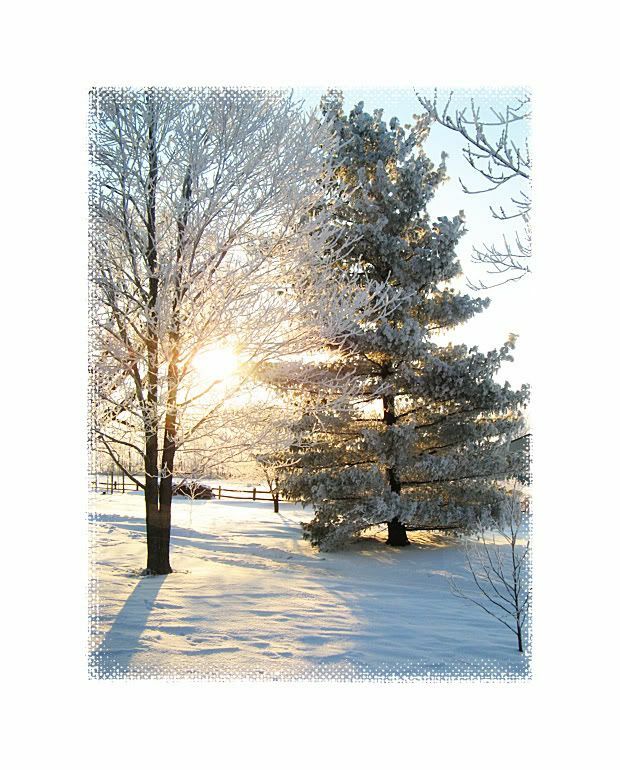 They are a peaceful and graceful tree, and I love spending time in the shade of the canopy of ours on a warm day. So Shirl, where is this island and when do we go? I want to be sure to get my ticket before they're all gone! And are kitties allowed to come, too? Though I'm anxious for winter to come to an end, this week has been quite beautiful in a way that only winter can do. 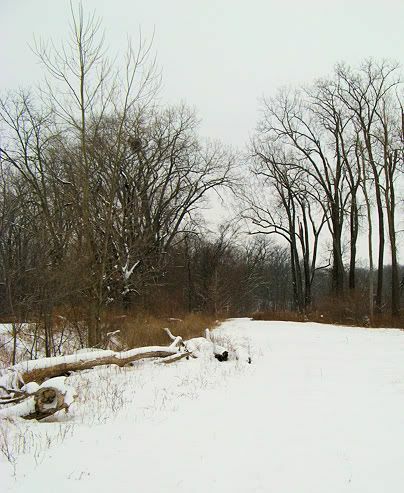 There are several inches of snow on the ground, which not only covers the dirty brown on the ground, but provides for brighter days even when the sun is hiding, due to its reflective properties. One of the most beautiful phenomenons that occurs only in winter is frozen fog. 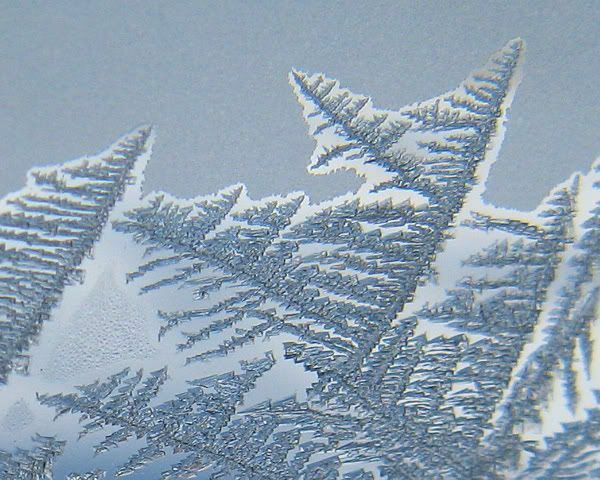 We had two mornings of it this week, and while I wasn't anxious to go out and do some macro photography, I did snap a few images through the windows. 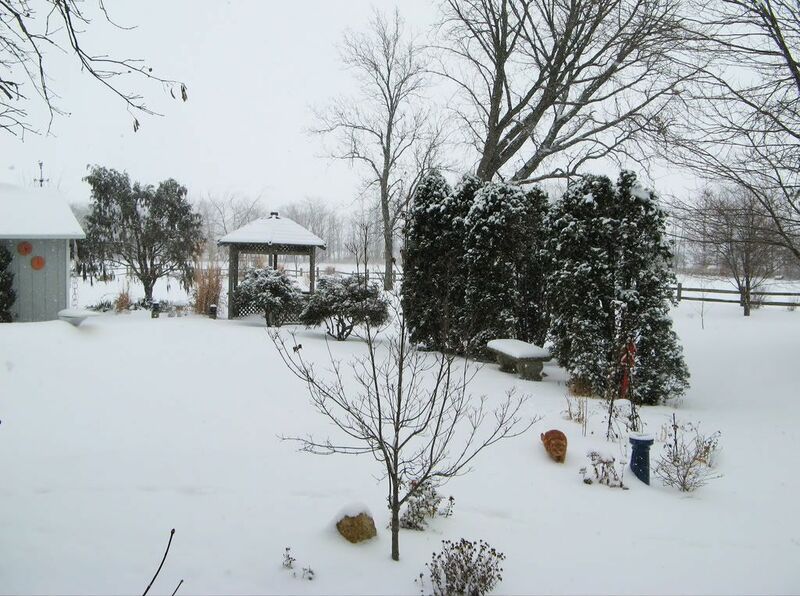 We have several feeders placed around the property, all within our view as we stay warm in the house. 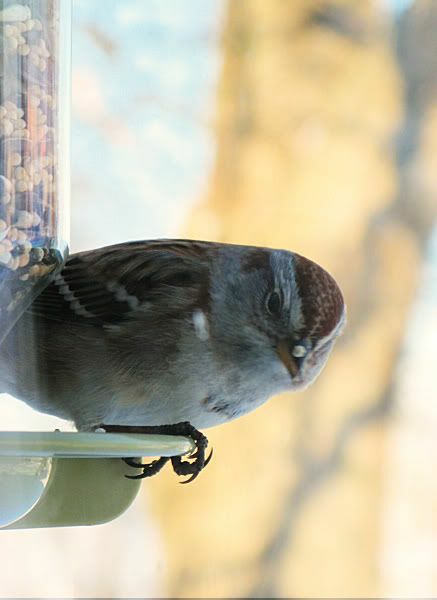 In fact, two of the most active feeders are attached to the windows of the family room. 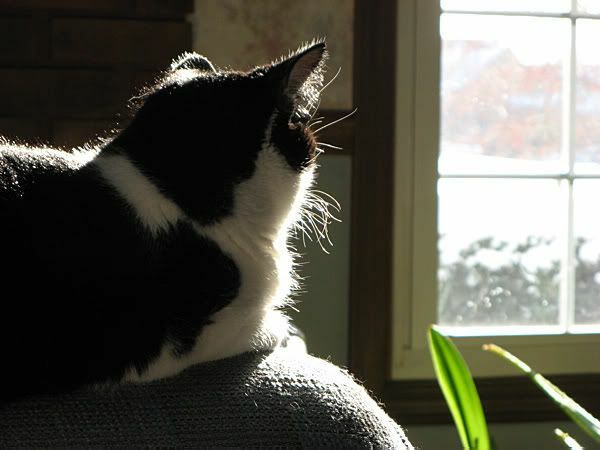 This not only provides us with entertainment, but the inside kitties spend much of their time watching and chattering at the birds when they're feeding. So far, there have been no out of the ordinary visitors to any of the feeders, but the regulars are spectacular and seem to be losing some of their shyness when we approach the windows for a closer look. We didn't see much of the blue jays all summer, but come winter, they have taken up residence here in great numbers. They intimidate the other birds and I've dubbed them "The Bullies." How can such a beautiful bird be so mean? 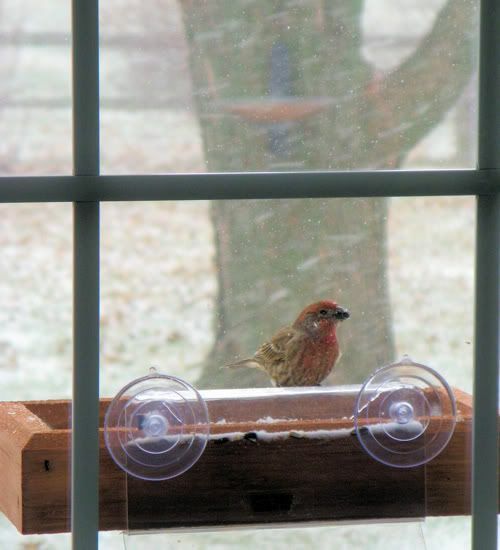 The house finches are a common sight at all of the feeders. They usually don't appear singly like the one in this picture, rather in groups of two or three. I love the red coloring they have. 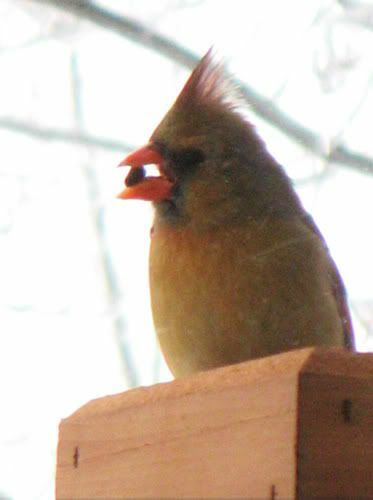 While the male cardinal is brilliantly handsome, wearing intensely red feathers, I find the female just as attractive. 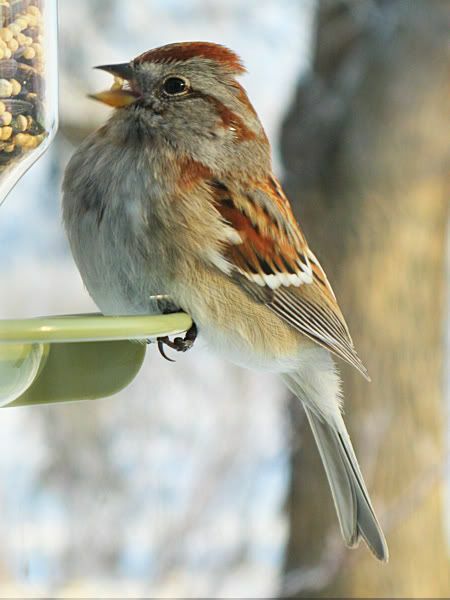 The soft brown feathers are a perfect contrast to the red beak. 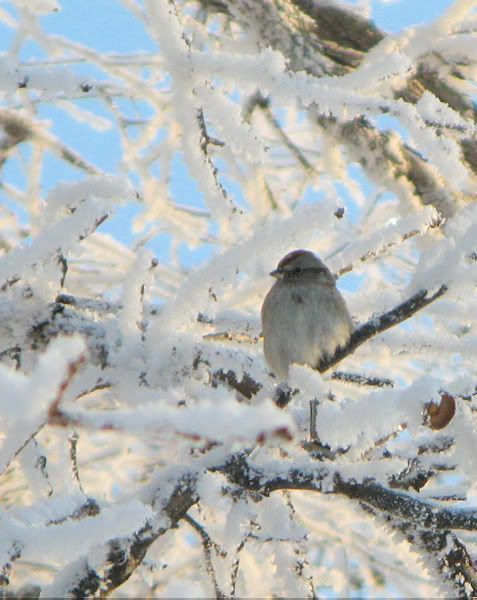 The most common feeder is the American Tree Sparrow. 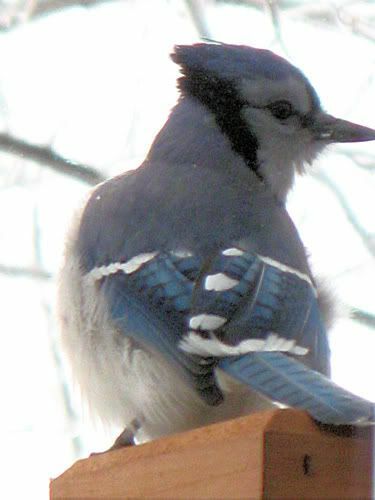 They are voracious eaters and the only thing that will get them away from the feeders is a Blue Jay. Though the Mourning Dove is a much larger bird than the sparrows, they eat side-by-side on a regular basis. "Mr. Sparrow, your beak gives you away. You've been eating seeds again, haven't you?" 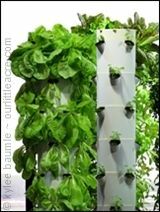 Eliz Licata over at GardenRant and Gardening While Intoxicated is curious. She wants to know where I put the 175+ houseplants I have during the winter. Stuart at Blotanical asked if I have a big house. And Ewa (Ewa In the Garden) is amazed. No, our house isn't big, but neither is it particularly small. It is just right for raising two girls and allowing them to have their own rooms. If you had come for an extended visit during those years, you might have had to sleep on the sofa bed, unless we could get the girls to share a room. Come now, and there are two spare rooms with beds. About those plants. I went around last night and snapped a few photos to show you where the largest concentration of plants are. Besides the ones you see in these pictures, there are others that are the lone plant in their respective locations. Let's begin with what you would see when you walk in the front door. Our living room is not a room that we use much at all. Our Christmas tree was in here, so we opened presents here, but we really don't spend any time in this room. 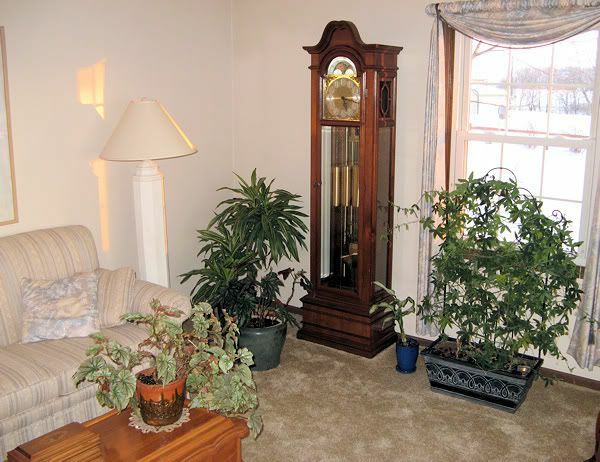 There are three windows, facing south and west, so it's a naturally sunny room, just right for plants. The large vining plant in the window is my Passiflora caerulea 'Clear Sky.' I've had it since May 2005 and it lives on the front porch once it's warm enough to put it outside. 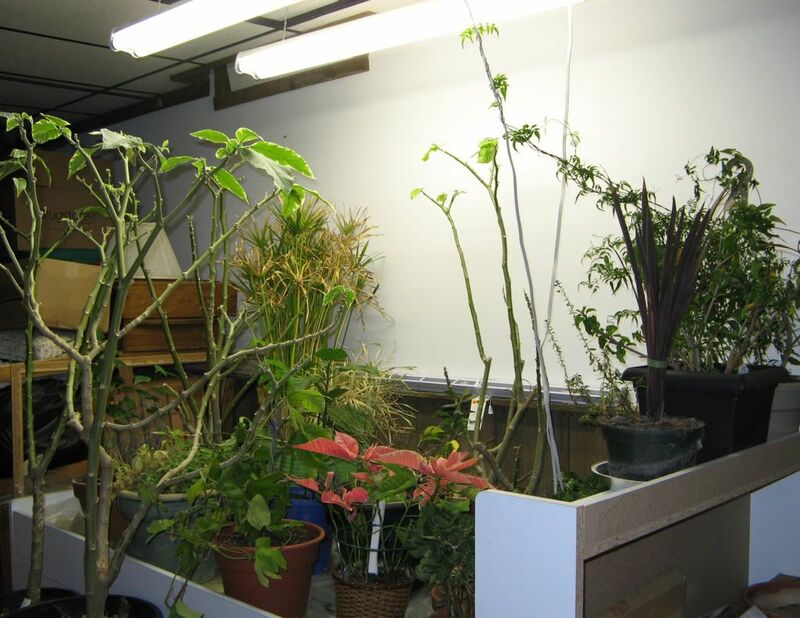 Many plants get moved around the house during winter, depending on their needs. Here we have the vining Clerodendron, which will suffer inside, but quickly recover once it joins the Passiflora on the porch come spring. The Ponytail Palm (Beaucarnea recurvata) will get moved to the other window where the Passiflora is now. A few of these will remain where they are. 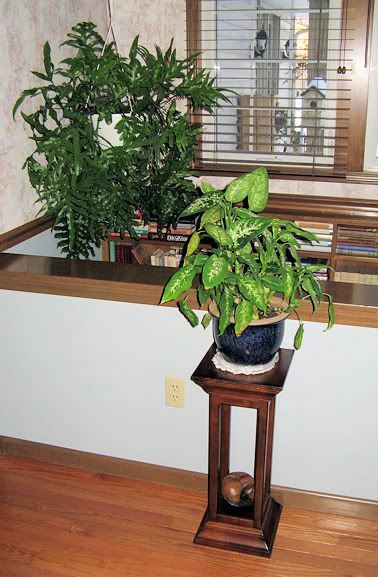 There are others scattered here and there in this general vicinity - Snake plant by the stairs, Pothos in the entry, orchid on the desk and Norfolk Island Pine beside the desk. As we walk through the kitchen, you'd notice there is only one plant in either the kitchen proper (a small hanging fern in the window) or the eating area. Not a lot of light here, so not much would do well. 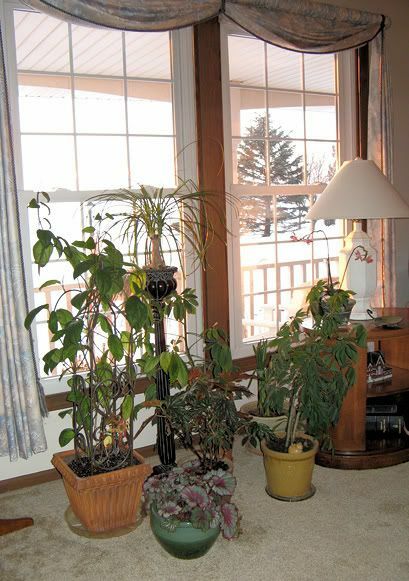 Into the family room and you'll see another group of plants in the south window. The hideous lime green pot is a temporary pot for a Bougainvillea that was in bloom previously. It will be planted in the ground come summer. It's still up here because it seems to be doing well and I don't want to interrupt its "wellness." Otherwise, it would be down in the basement greenhouse with the other one. The Jade is the only plant that resides here year round. The others will be outside for the summer, including the Amaryllis on the left. Above these hangs a Hoya. On the other side of the room, there is a plant stand with a Dieffenbachia recently given to me by a co-worker. The Kangaroo Fern (Microsorum pustulatum)hangs over a stairway to the basement, where it has hung since I bought it in 2006. Not shown is another plant - Goldfish Plant (Nematanthus gregarius) - that hangs over the other end of the half-wall, which will go outside for summer. On top of the wall unit in this room is a Palm of some sort that the same co-worker gave me. A Brugmansia sits on the floor by a different window. Just off the kitchen eating area is our utility room, where you'll find another large group of plants huddling around the south window. The Coleus that I brought in for winter just had a pruning a week or so ago. I hope to keep them going until spring when I'll return them to the outside gardens. They were so pretty this past summer. 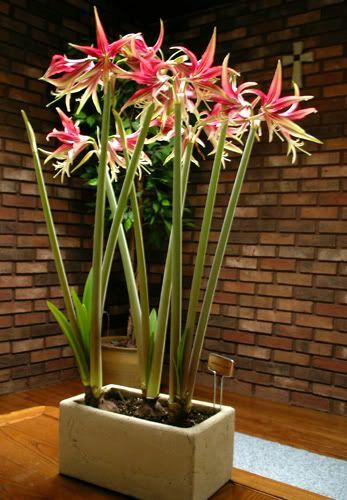 There are many potted Amaryllis here, in various stages of growth. As they bloom, they will be brought into the family room to the coffee table so we can enjoy their blooms. There is also the variegated Abutilon, which will go outside come spring. 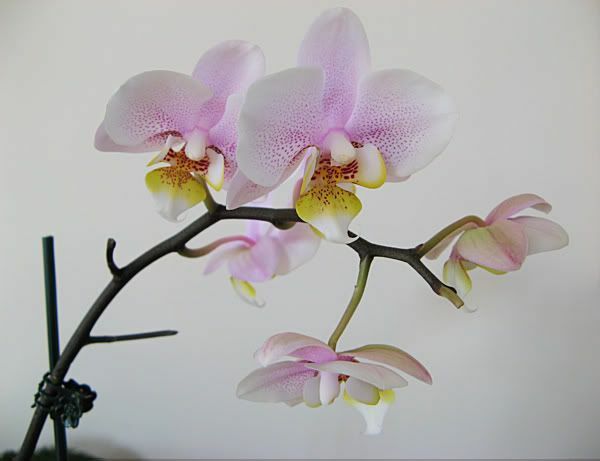 There are Orchids and African Violets here, too, as well as another Jade. The hanging plant will go outside. This area looks quite different in the summer with fewer plants. Off the kitchen proper is a formal dining room, which we never use for formal dining. It is a room kind of off by itself and it has a door, which remains closed most of the time, because this has turned into a catch-all room. My desktop computer is in one corner, and the French doors to the patio go unused during the winter, except to provide light for plants. Nearly every one of these plants will go outside in the summer. 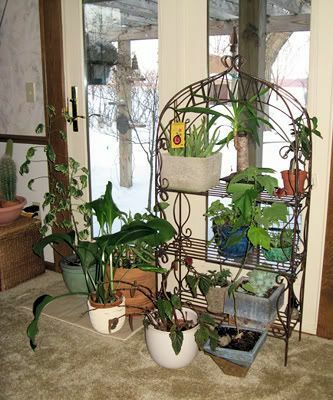 The plant stand will be used outside for the Orchids, in a mostly shady spot that only gets a small bit of morning sun. They love it there. Next, we go downstairs to the basement greenhouse. In the room that contains the water heater, water softener and sump pump, there are two hanging shop lights with fluorescent bulbs that can be raised or lowered as necessary. Come summer, this area will be plant-free. Two rooms away is another "greenhouse" with two more shop lights. All the plant lights are on a timer. The Brugmansias overwinter here, as well as the water plants and other outdoor plants. They are on an old single bed frame that isn't used anymore, lined with heavy plastic. This is a storage room that I hope gets a bit cleaned out this summer. Too much stuff! 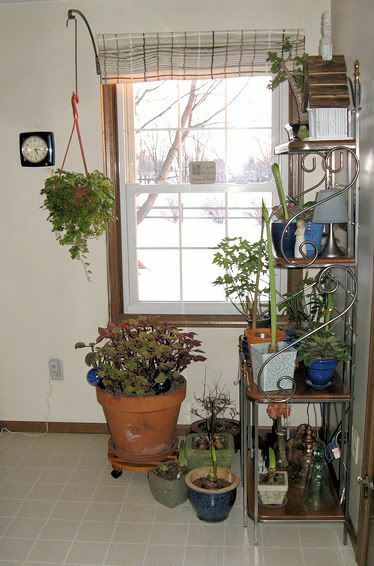 There are a few plants upstairs in the bedrooms and bathroom, but only four total. They reside there year round. While contemplating how quickly the days might pass by until I can board a plane and soar to a warmer place, a thought popped into my head. I wonder if the temperature under a layer of snow is warmer than it is in the open air? What!? The two are related! We who live in the frozen tundra throughout the winter months give these things some thought. 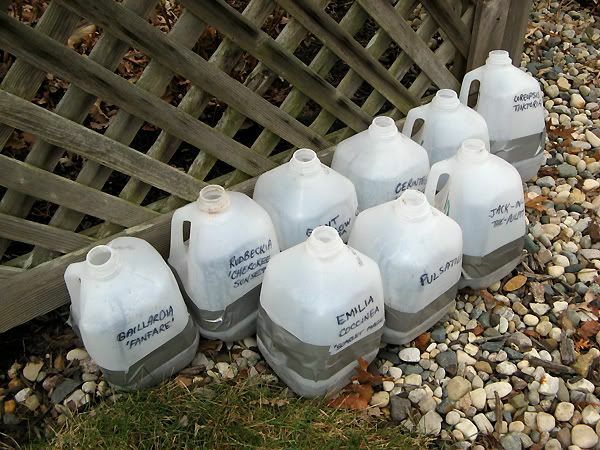 We have precious perennials that have to get through the winter and sometimes it's as tough on them as it is us. 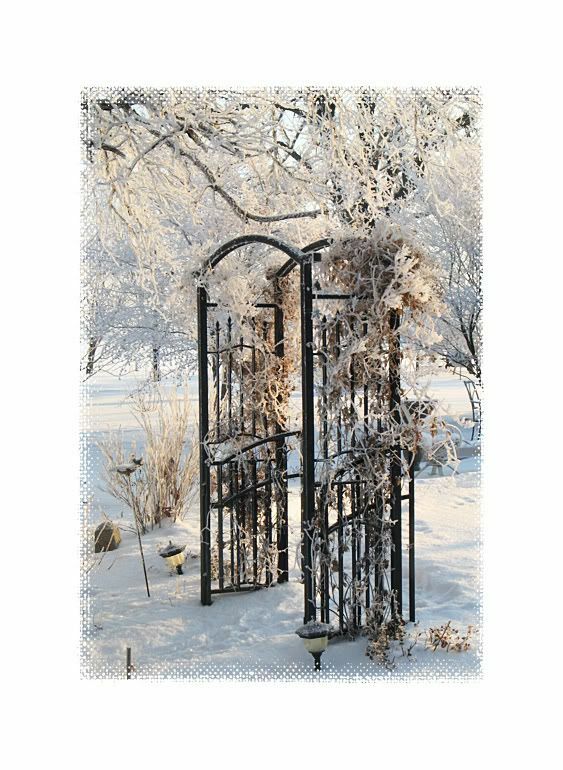 I live and garden in USDA Hardiness Zone 5b, which means (among other things) that perennials have a good chance of surviving temperatures of -15°F to -10°F. That's air temperature, not wind chill. 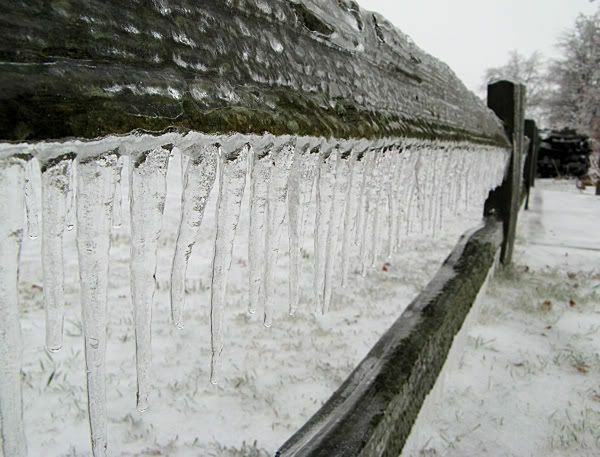 Plants, unlike humans and animals, are not affected by wind chill, although the winds themselves can be damaging to woody plants. Just outside our family room window, on the south side of the house, we have a microclimate. I'm convinced that it's a full zone warmer there than any other location on our property. It gets the warmth of a southern exposure to the sun, as well as being mostly protected from strong winds by a row of yews that run diagonally from the corner of the house to the southeast. This fall, I planted some marginal plants in this area, in an experiment in trying to see if they would winter over. Coreopsis 'Limerock Dream' (Coreopsis, Zones 6-9) and Mexican Feather Grass (Stipa tenuissima, Zones 7-10) are there, as well as a young Maypop (Passiflora incarnata, Zones 6-10). The Maypop was shared with me from a fellow garden blogger, Kathy at Tangled Branches. That was an experiment in itself, yet to give results. May will tell the story. But what about this -20°F stuff we had a couple of days ago? That's well below the limit of Zone 5. As the snow came down earlier this week, I was happy to see it. 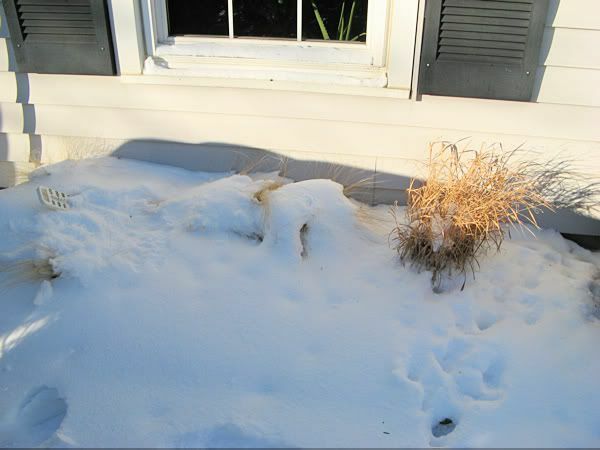 Snow is a great insulator for these plants we grow and love. Without it, only the strong survive the coldest temperatures. 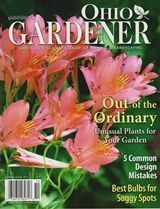 With most perennials, we're concerned mainly with the root structure and the crown of the plant, not with what may be left standing up in the air. There's warmth in the ground and we want it to stay there. Mulch helps. And so does snow. Think of it like bubble wrap. The pockets of air in snow are what help prevent the warmth from escaping the ground. Snow is a good thing. Now, back to what I wanted to know in the first place, and the reason for this blog post. 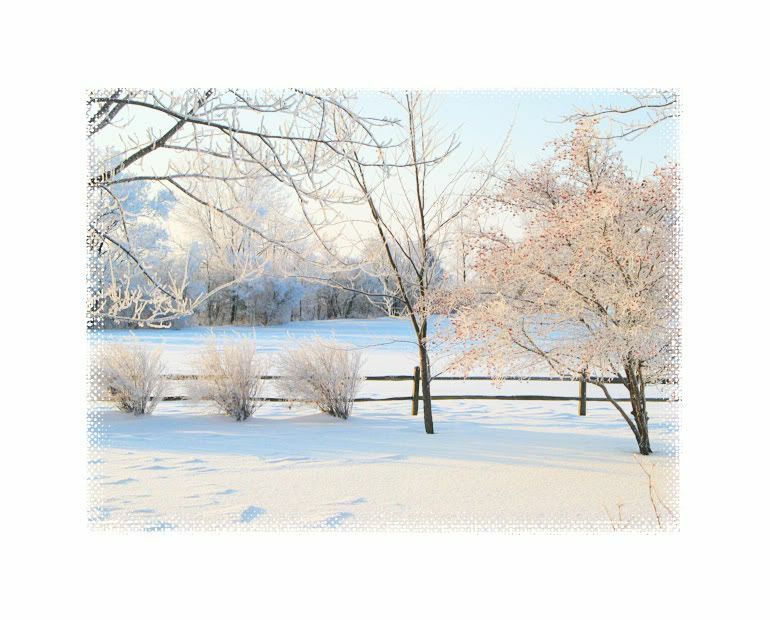 Is the temperature down under the blanket of snow warmer than the air temperature? 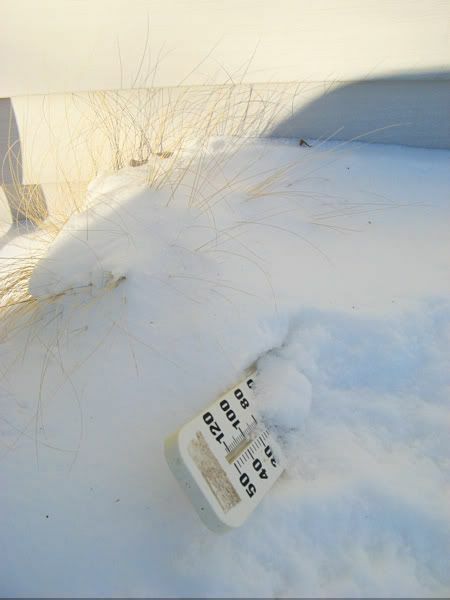 I put the thermometer down in the snow as far as I could and left it in place for about thirty minutes. The thermometer outside read -5°F. Okay, so it's only a difference of five degrees. But hey, it IS warmer. So there. I'm going to get personal here, even more than I may have ever done in the past. Today, it doesn't matter whether you're a gardener, a bank executive, or a social worker. It doesn't matter whether I am either. For the past ten years, this weekend in January has always been an important one in my life. Because of my life. I'm still living it. My neighbor asked me the other night how I can remember dates so well, when we discussed what happened ten years ago. I told him, "When you've been given a second chance at life, believe me, you remember it." I've spoken before about the illness that nearly took my life. If you've ever experienced bacterial meningitis (Neisseria meningitidis) or know someone who has, you know the seriousness of it. There is a commercial on TV right now that shows children on a playground, seemingly healthy and happy. The voiceover says, "This is what bacterial meningitis looks like just 24 hours before it takes a life." It's true. I won't go into the details of that weekend. For one thing, I spent half of it and a day, unconscious. But I remember how I felt before everything went black and I remember how long it took to recover. Two comments people say to me on a regular basis when they learn of my miraculous healing, are "I'll bet you live your life differently now," and "God must have had a bigger plan for your life." Perhaps. I have always been one to be watchful for opportunities and take them when possible. But I do have a new appreciation for those that live with chronic pain, the one remaining effect I have that has indirectly been blamed on the meningitis. As far as the purpose for my life - I am convinced that God didn't answer those hundreds of prayers that were said on my behalf, for my own purposes. 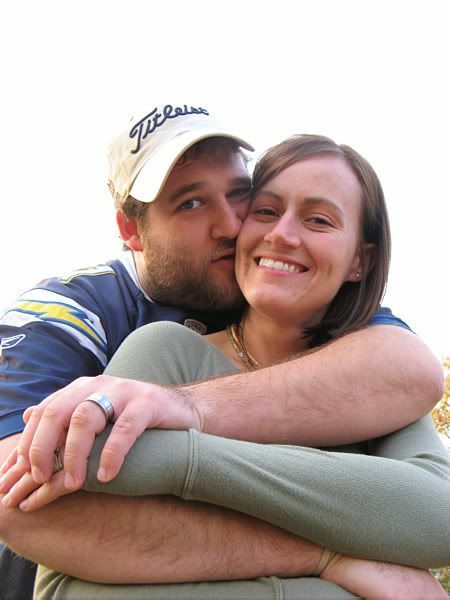 Without me, Romie would have been left to raise two teenage daughters on his own. Jenna was 16 and Kara was 18. What a daunting task that would have been. So on this, the tenth anniversary of the beginning of the rest of my life, I thank God for the many, many blessings that have come my way. I can't begin to list them all, but as I look back over these years, I think I am the most thankful that I was here to experience the transformation of our two girls into lovely young women. 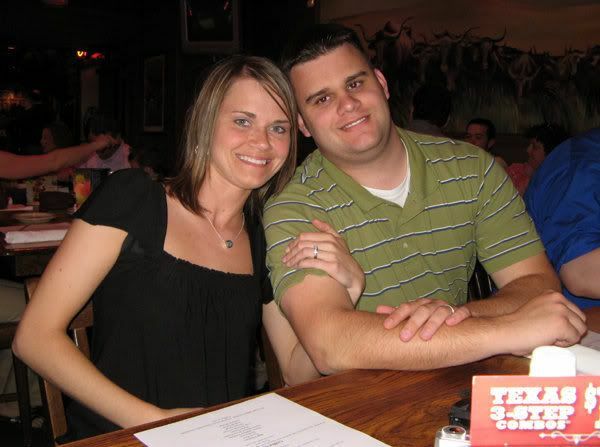 Together with Romie, we have experienced their high school and college graduations, numerous sports accomplishments and awards, relationships that culminated in marriages, and success in their chosen fields. They are good and happy girls who love their families and their God. What more could two parents ask for? I would be remiss if I didn't give my mom a special thanks. She spent three weeks with me, helping me begin my recovery. I have good memories of the time spent with her. We took my first walk outside in the yard on a warmish winter day to cut forsythia branches for forcing. She cleaned my house as only my clean-freak mom can do. (Just kidding, Mom! Want to do it again?) 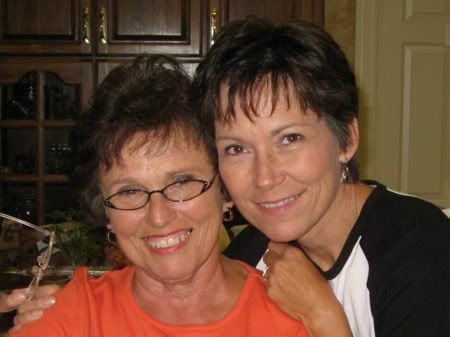 She cooked for me so I would have nutritious meals, helping me to heal faster. We read Winnie-the-Pooh together because she knew I loved it and she'd never read it herself as a child. 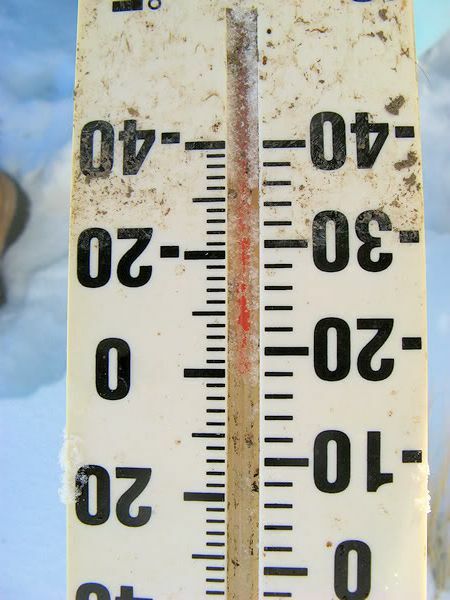 It was -15°F when I got up this morning and at three in the afternoon, it's hovering around 0°F. The wind chills are scary and this is one woman who is glad she doesn't have to go out in it today. I wonder if the inside cats even have a clue what's going on outside that sunny window? plump as a jelly-filled scone fresh from the oven. thoughts. He relaxes his head. Kisses the blanket , dreaming of his milky mama-cat. like the pressure of an accelerating engine. Half open, his lizard eyes glaze over like frosting on a doughnut. I give in to the desire to kiss his head, rub his ears, and he smiles. As I leave him sleeping,I head back to life. Just what is comfort food, anyway? Wikipedia defines it as "...typically inexpensive, uncomplicated, and easy to prepare. Many people turn to comfort food for familiarity, emotional security, or as a special reward. The reasons a dish becomes a comfort food are diverse but often include pleasant associations of childhood." One of the things on my list of comfort foods is tapioca pudding. I'm not talking about the Minute Tapioca, but the large pearl kind. My great-grandma used to make it and bring it for Christmas at my mom's house and for other family gatherings. Hers was unique, because she went heavy on the yellow food coloring. I don't put any coloring in mine. Winter can be a depressing time when you live in the Great White North. With wind chills at -35°F to -40°F, who couldn't use a little comforting? I have my microfiber fuzzy jammies, a soft blankie, and a kitty or two to snuggle up with, but that's made all the better by tapioca pudding. Soak tapioca for 12 hours in water. Over medium heat, heat tapioca, milk and salt to boiling, then simmer for 15 minutes, stirring frequently. In a small bowl, beat eggs with sugar. Gradually stir in a small amount of hot tapioca mixture. Slowly pour egg mixture back into tapioca mixture, stirring rapidly to prevent lumping. Cook for about 5 minutes more until mixture thickens. (Do not boil.) Remove from heat. Add butter and vanilla. This is a Swedish recipe from Bishop Hill Heritage Cookbook and was published about 30 years ago in the Fort Wayne Journal-Gazette. 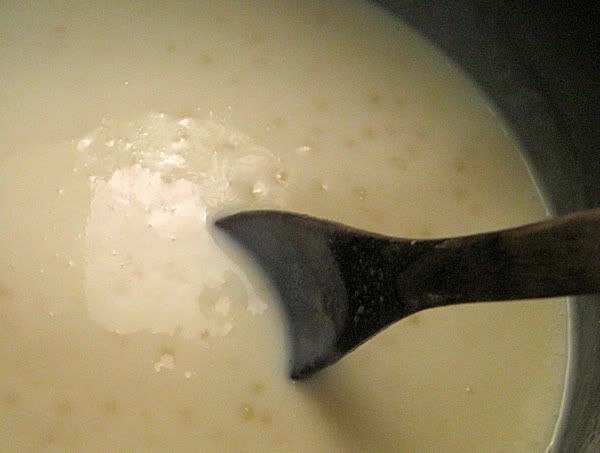 Tapioca is made from the processed root of the cassava plant (Manihot esculenta). 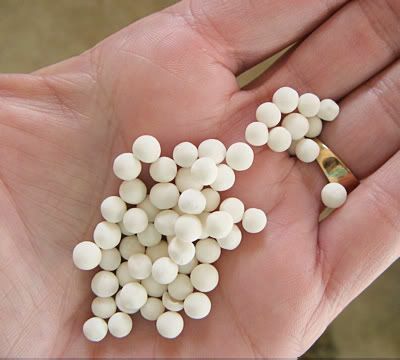 It's an odorless, colorless, tasteless starch and is used not only for pearl tapioca, but as a thickening agent. Tapioca is gluten-free and nearly protein-free and is opaque until it's cooked, when it becomes translucent. The plant is native to South America, but is now cultivated throughout the world. I...um...have a reputation. 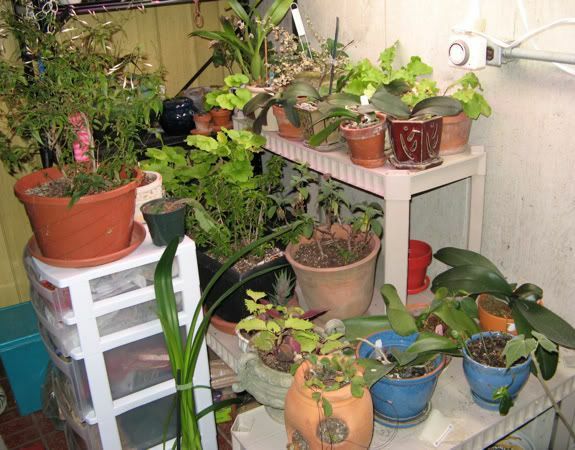 While it may or may not be a bad one, having over 175 plants living in the house during the winter does give some people pause. 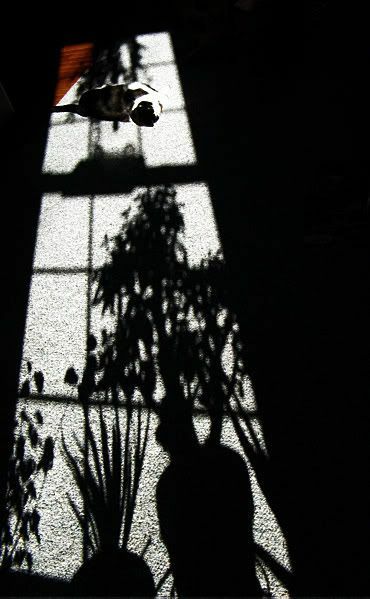 I've seen my name mentioned in connection with this overabundance of house plants here and there across the blogosphere. I'm here to set things straight. 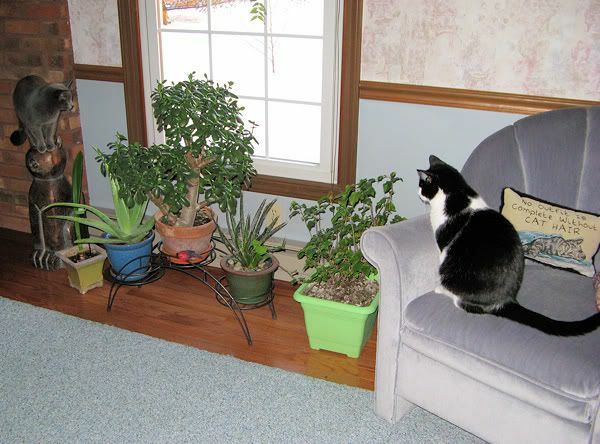 Just because I have a large quantity of plants doesn't mean they're all worthy of the space they occupy. Yes, I have been obsessed in the past with plants in general, and I used my obsession to get me through the insanity that is winter in the midwest. I'm not saying I'm over this plant thing, because I don't think I ever will be, but I find that I'm becoming a bit more "selective" about the plants that receive the most attention while being holed up with my kitties and me. While I am one who finds it difficult to toss even a pinched-off coleus tip to the compost bin, I'm tired of coaxing petulant plants to perk up. Before the winter is over, I predict the plant count will be down by a few, and that's really okay with me. Meanwhile, today is Garden Bloggers Bloom Day, when we are supposed to post what we have blooming in our gardens. Amazingly, last January there were English Daisies blooming outside. This year? Not a chance. If there is anything blooming outside, it's well insulated from view by several inches of snow. Somehow, I doubt if there are any blooms under that, though. Even as good as snow is at insulating the plants, we are having the coldest temperatures in 15 years right now. As I type this at 11:00 p.m., it is -13°F, on its way to -20°F for the night. Tomorrow's high is to be -1°F. Wind chills may reach -50°F. With so many plants in the house, you might think I had many things in bloom. Not so! There are several amaryllis that will probably be open next week, but none right now. There is a jasmine that is loaded with little pink buds that will open white one of these days. A few kalanchoes have sparse blooms, but nothing to brag about. 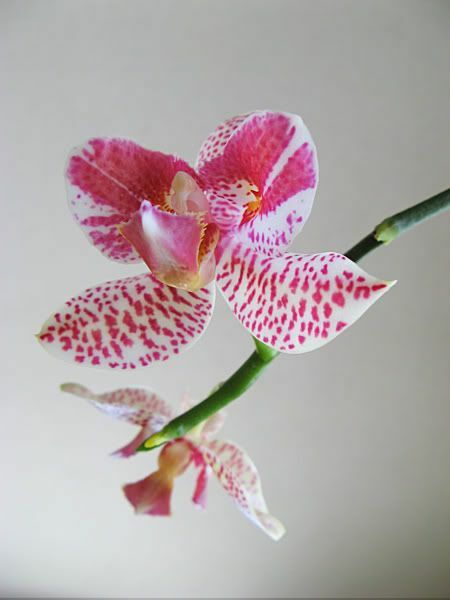 There is that new orchid I bought on Monday. 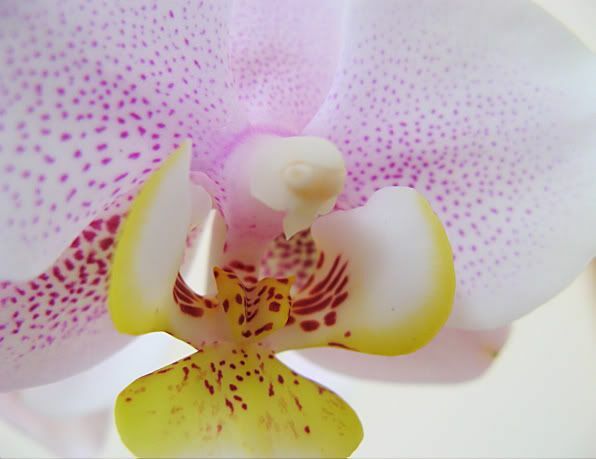 But there is also another orchid blooming. It opened over a week ago and I was thrilled. This one is a rebloom of an orchid I bought last year. I have photos of its blooms from last March and now here it is, blooming again. It's not the first time I've had an orchid rebloom, but I count myself lucky when it happens. 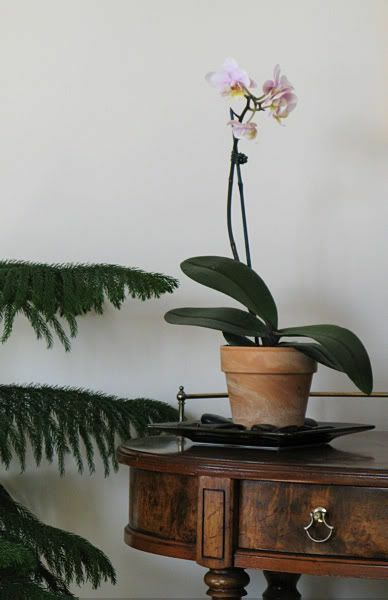 I'll take one good flush of blooms from a single orchid plant over a whole roomful of other plants any day. 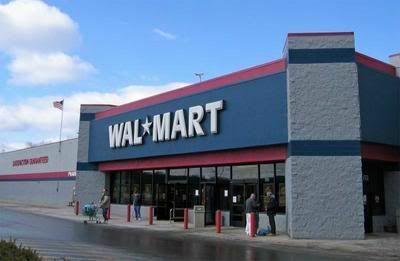 Gone are the days when I couldn't walk out of a Walmart or Lowe's without taking a side trip to the gardening department during winter. (I haven't managed to accomplish that feat during planting or growing seasons yet.) But with over 175 plants taking up residence inside the house during winter, it makes no sense to bring more of them home. Wait. Since when did sense have anything to do with plant buying? I really have tried to rein in my obsession. The state of the economy is reason enough. But there is that thing called the January Jitters. Anyone who lives in a climate where you're forced by things such as Alberta Clippers to store your garden tools for a few months has likely suffered through this midwinter malady. 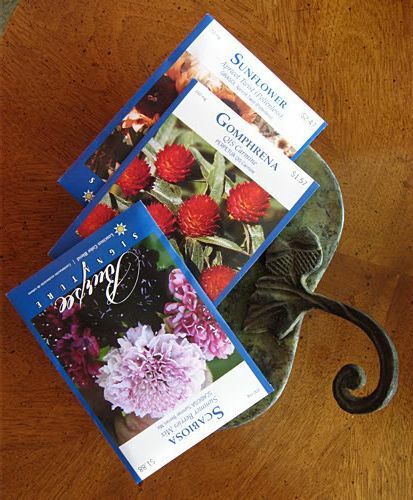 At first, you welcome the break from the garden, after a busy spring, summer, and fall. Your garden needs the rest and so do you. But like anything that has been a daily habit, you start to go through withdrawal, until the holidays steal your attention. 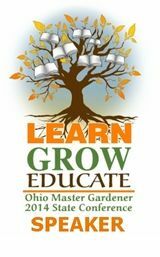 There are so many other things going on that gardening can temporarily be shoved to the back burner. 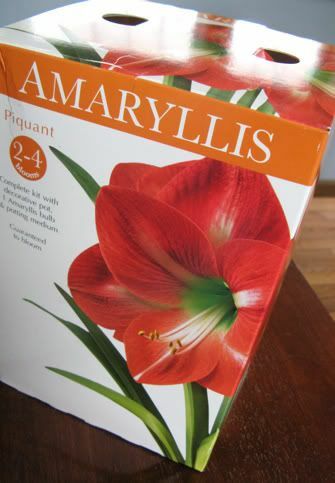 Oh, there might be an amaryllis bulb here or a poinsettia there, but even normal people buy those. And then January comes. The weather is in a snit, everyday work routines resume, and the next major holiday is far off in the distance. We dream of vacations to warmer climes and check the calendar again, with the hope that this will be The Year That February Forgot. We're itching to be back in the garden again. 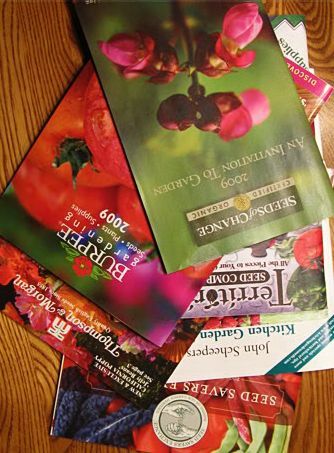 One day, you walk to the mailbox and there's one, maybe two, seed catalogs. The next day, there are a couple more. You resist looking at them, because you can't plant seeds anyway. Or can you? Of course! There's winter sowing. You know you won't see the fruits of your labor until spring "springs," but hey, at least you get to play in the dirt. And there's your downfall. You let yourself start thinking about the garden, you get your hands dirty, and you're off and running. Try to resist? Some are better at it than others, but like any other addiction, it will resurface once you've had a little hair of the dog that bit you. And that, my friends, is what happened to me this past weekend. And yesterday after work. I'd done so well! I'd only bought one amaryllis bulb at Meijer and one at Walmart. Then I thought I'd attempt a poinsettia again. (Don't ask.) That was way back in December. Christmas came and went and after three winters of winter sowing, I decided not to do it this year. Sunday, we took the afternoon to finish making Christmas and other returns, one of which needed to go back to Lowe's. The return desk is situated directly across from their seed display. Oh...the colors! I thought I'd just take a look. Gosh darn it. One thing led to another. I saw these apricot pollenless sunflowers that looked interesting. And carmine Gomphrena. I'd planted Gomphrena last summer, thinking I was going to get red ones, and they were pink and purple. Oh, and they had 'Summer Berries' annual Scabiosa again. I planted those a little late last spring and while they eventually started growing large enough to flower, a hard freeze ruined them before they had a chance. Daughter Kara was along with us and while I was looking at the seeds, she went back to the houseplant area and found amaryllis bulbs marked down to $3.49. I just wanted to see what they had left and if they were decent bulbs that hadn't started flowering inside the box. Uh huh. They also had crocus kits with three bulbs and the glass forcing vases for $2.24, but I didn't buy one of those. Good for me! I left Lowe's with three packets of seeds and one amaryllis bulb. I had to use some store credit they'd given me anyway, so I really got those almost for free, right? Just the thought of planting the seeds in the spring as well as having another pretty amaryllis flower for the winter put a smile on my face and a spring in my step. I don't think I did too badly now, did I? The next day, I worked in Fort Wayne. My route home takes me past another Lowe's. As I was sitting at the light, waiting for it to turn green, I looked over at Lowe's and wondered if they still had any of those crocus kits. I'd never forced crocus before and thought it might be a fun thing to do. The kits were so cheap - why not? Sure enough, they had several kits and I picked one up. I decided to just walk through the house plants and see what they had, since this was a different Lowe's than I'd been in the day before. You know what's the best cure for the January Jitters? I feel so much better now. The shakes have nearly disappeared. "Celebrate your success and stand strong when adversity hits, for when the storm clouds come in, the eagles soar while the small birds take cover"
We pass by a well-known bald eagle's nest on the way to our daughter and son-in-law's house, and we always slow our speed to perhaps catch a glimpse of an eagle in the nest. (I wrote of it in October 2007.) We've been lucky several times to see its white head peeking out, but never out of the nest, not even in flight. Today our luck changed and I can't tell you how exciting it was to see our national bird perched and then soar above our heads. 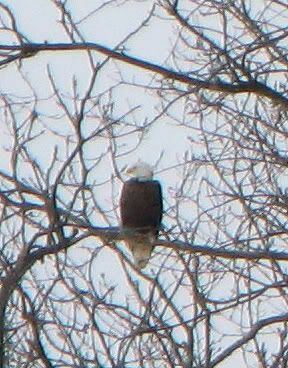 I had my camera with me, as usual, but it doesn't have the zoom power to reach an eagle's lofty environs. That doesn't mean I didn't try, but please forgive the poor quality of the photos. I wanted to share at least a bit of the thrill with you. 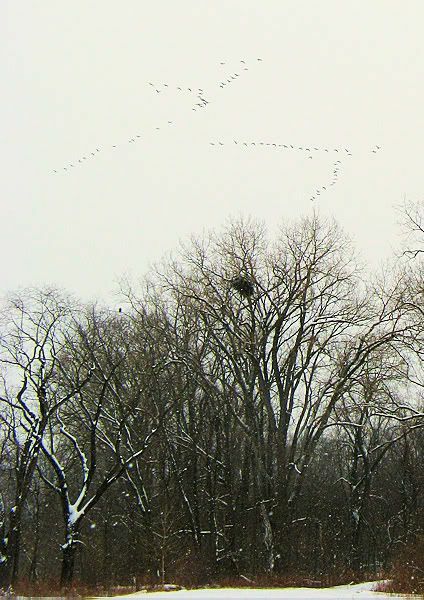 the banks of the Auglaize River. The nest has been here for years. time, two Vs of geese flew over. And there he sat - regal - and watching over his territory. our right. After a brief rest there, he returned to his original perch. When we returned home by the same route, he was gone. An eagle becomes fully mature at four to five years of age. When full-grown, the adult eagle is actually slightly smaller than the juvenile eagle due to the number of feathers lost in the molting process. Even in adulthood, bald eagles are among the largest birds in North America.